Bob Clark posing with staff member. Bob's as energetic a performer as you could hope for! He can tone it down, too, with quality background music. 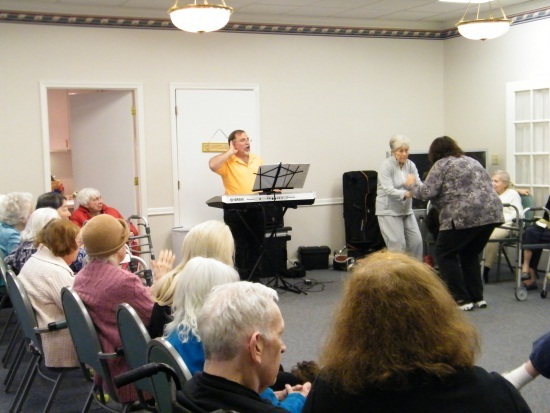 Since 2003, Bob has entertained seniors at more than 360 different facilities throughout Maryland, Washington, DC, northern Virginia and Connecticut. In addition to providing great music from the past, he truly entertains! He is very interactive with his audiences and keeps them mentally and physically engaged throughout his performance. 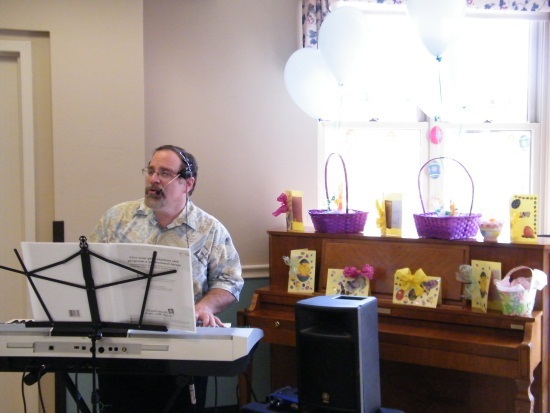 He includes show tunes, jazz, Latin, country, and patriotic music, as well as pop music from the 50s to 80s.Bob will perform songs by Fats Waller, Nat King Cole, Frank Sinatra, John Denver, Billy Holliday, Perry Como, Eddie Arnold, Hank Williams, Ray Charles, Duke Ellington, the Beach Boys, Beatles, Eagles, Temptations and many others. Family members and staff love Bob's shows, too! 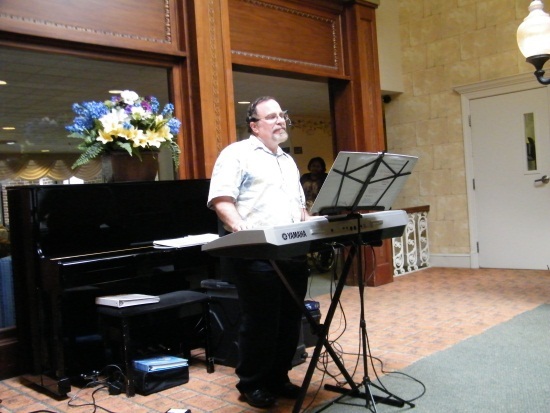 For the majority of his performances, Bob plays a Yamaha PSR-s970 Arranger/Composer keyboard and sometimes uses a microphone. While the full-sounding background arrangements enhances his performance, Bob doesn't depend on them. He has the ability to play straight piano background accompaniment and can play your facility's piano, if that is preferred by your residents, in certain settings, such as a strictly-light classical music concert, or for a Sunday Brunch, or Cocktail Hour. Please note: the piano must be in-tune and functioning properly. 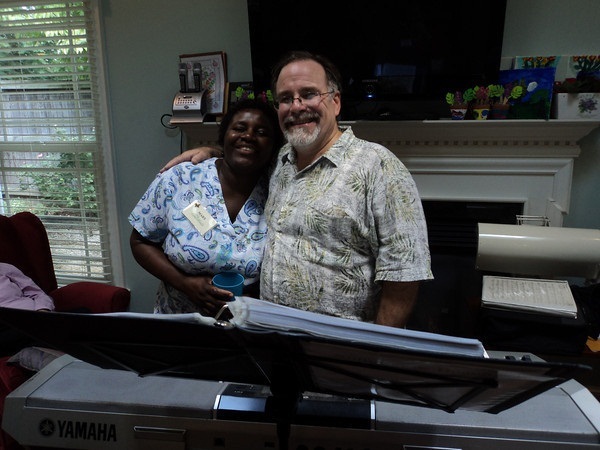 Bob can play your facilit's electronic keyboard in lieu of using my keyboard, if that is preferred by the staff or residents. He is familiar enough with the various makes and models of digital keyboards to get the most out of whichever type your facility owns. Bob requires a 5-foot by 5-foot area, preferably near a grounded elctrical outlet,to set up his equipment. A well-lit area (for reading sheet music and for the audience) is preferred. Set-up takes between 5 and 10 minutes, depending on equipment used. Amplification varies from setting to setting. For very small rooms with 10 or less residents: the keyboard and its speakers. For larger rooms with audiences up to 30: a powered speaker and vocal mic. For large rooms & outdoor settings: a Bose L1 PA system and vocal microphone. Whether playing a small room with few residents or a large room or outdoor venue, the volume is adjusted to suit the desires of my audience. Please contact Bob to obtain a quote on pricing. Mr. Clark offers a quality product and expects to be compensated, accordingly. Bob Clark will take into account extenuating circumstances, such as census drops and budgetary constraints, and is willing to be flexible with his pricing. However, this is his vocation and, as such, he expects that, once the Activities Department is solvent, his payment will be increased. You may schedule shorter shows, schedule 2 or more shows in a day, or schedule on days when Mr. Clark will be be performing in your area, for a better deal. Discount coupons are available. Please, visit that section of this site. Please be advised that standard fees apply for normal budgets and/or increased census. * Upon request, I will provide names and phone numbers of the Activiies Directors with whom I have worked.